La Verne would go on to win the game 24-14. ULV came into the game sporting a 1-3 Southern California Intercollegiate Athletic Conference record with their Occidental opponents at 0-4 on the season. “Their record doesn’t really show how good they perform on offense. Their offense is pretty decent if you go back and watch their previous games,” senior running back Martaveous Holliday said. ULV won the coin toss and elected to receive, but this proved to be a mistake as the Leopard offense went three-and-out after three rushes and were forced to punt. Occidental’s offense proved to be efficient with a potent run attack that drove them all the way up the field. The Tigers continued to run a triple-option play, where the quarterback had three options to deliver the ball: he can hand it off to the running back, he can look to pass it to a receiver, or he can elect to keep the ball and run it. This play proved troublesome for the Leopards, as Occidental drew first blood after scoring off of a 2-yard quarterback sneak on the goal line resulting in a 7-0 Occidental lead. However, the Leopards were quick to respond with their own read-option plays. After a 20-yard run by senior quarterback Josh Evans, he handed the ball off to Holliday, who broke past several defenders on his way to score a 45-yard touchdown, tying the game, 7-7. The Leopard defense held strong and after two huge back-to-back run stops, the Tigers were forced to punt. The Leopard offense continued to run the ball, either on hand-offs to Holliday or designed quarterback runs for Evans. “We tried to run the rock like we always do, always try to run the ball, pass it a little bit when we get the opportunity to. I thought if we got the ball moving on the ground it could open up the passing game,” Evans said. The read-option play proved to be too much for the Tiger defense, as Evans would gash them again on the ground for 37 yards. Evans and Holliday would lead the team in rushing, ending the day with 78 and 81 rushing yards respectively plus a touchdown by Holliday. “[The read-option] was effective because our quarterbacks were making the right read. That’s the key to it, making sure our guys make the right reads because if he doesn’t read the right thing we’re in trouble,” head coach Chris Krich said. “We were really proud of the fact that we were reading the right thing and getting the ball to the right guy that needed to have it and that really helped us out,” he said. Although the Leopard offense would falter at times, giving up two fumbles (one on the Occidental goal line), the defense held strong and quickly adjusted to Occidental’s triple-option offense. “We wanted to see if we could run the football, which I thought we did pretty well. And if we could stop the run was a big thing, and although they gave us some trouble, I thought we really came out and adjusted well after that first series and did a nice job,” Krich said. Sophomore kicker Diego Garcia would nail a field goal to close out the half, giving La Verne a 10-7 lead heading into halftime. Coming into the third quarter the Leopards came out of the locker room looking re-energized and ready to lay hits. On the ensuing kickoff return, La Verne would force a fumble off of a huge hit, but it was recovered by Occidental. The third quarter proved to be a stalemate, with both teams struggling on offense but shutting down the other while on defense. This led to a scoreless third quarter. The highlight play of the afternoon came at the beginning of the fourth quarter off of an Occidental punt. Sophomore receiver Nathaniel Sagastume received the punt and after juking the first defender, no one was going to catch him. Sagastume returned the kick 70 yards for a touchdown, opening up the score 17-7. “We set up a scheme where the blocking was there and they were able to open it up for me to take it to the house,” Sagastume said. After another stop on defense, the ULV offense was able to score once again, this time with junior quarterback Sam Taylor running it in from 15 yards out stretching La Verne’s lead to 17 points. However, after a defensive miscommunication and a great touchdown pass from the quarterback, Occidental would get back on the board to make the score 24-14 La Verne, keeping them in the game. It felt as if everything started going right for the Tigers, as they would also recover their onside kick following the score, giving the ball back to their offense. But ULV’s defensive front proved they could be counted on to deliver. After Occidental junior quarterback Joshua Greaves was hit as he threw, it led to an overthrown ball and a spectacular diving interception from sophomore cornerback Raymond Moronez that sealed the game for the Leopards, 24-14. ULV finished with 383 total yards of offense compared to Occidental’s 245. “We just need to be more consistent.When we play good, we play good, and if we play bad, we play really bad. So we really need to work on that,” Holliday said. While the team is happy they got the win, players feel that they could have performed better against Occidental. “Offensively we definitely need to work on some things. Just coming out I think we were a little lackadaisical at times so that kind of hurt us in the long run, and then defense did a good job at shutting down their offense, so everything worked out,” Evans said. The team, now 2-3 in SCIAC and 2-5 overall, looks to play on the road at Cal Lutheran next week. “We play Cal Lu next week, I think that’s gonna be a bigger challenge for us. I think we’ll have to gear up a little harder for that,” Evans said. Cal Lutheran is tied with La Verne in fifth place in SCIAC. The Leopards and Kingsmen will kick off at 1 p.m. at William Rolland Stadium in Thousand Oaks. 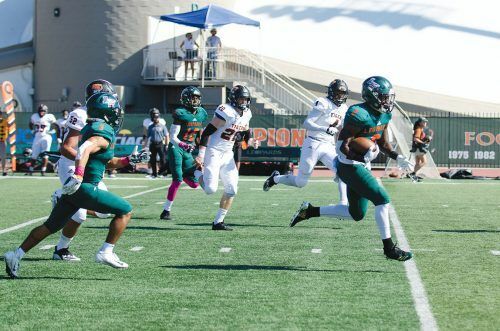 La Verne will wrap up its season Nov. 10 at Chapman.